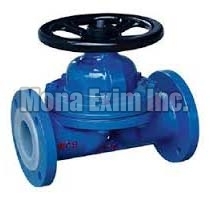 Our company is a distinguished Manufacturer, Supplier and Exporter of Diaphragm Valves. The Valves we make available are known for their leak proof design, reliable performance and long functional life. We maintain a large stock of the Valves in our spacious warehouse, to meet the bulk and urgent requirements of the buyers. The entire range of the Valves is reasonably priced by us.